Choosing the right tooth replacement treatment plan can be a daunting task. With so many advancements in modern dentistry and so many options to choose from, you might feel overwhelmed with exactly how to pick the best route to your perfect smile. However, we believe that the strongest, most durable solution comes in the form of dental implants and the team at Rockefeller Cosmetic Dentistry can provide top dental implants in NYC. Missing teeth can cause poor appearance and poor self-esteem. 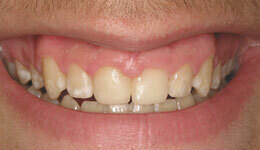 Due to the decrease in support of the lips, missing teeth can cause a sunken in, aged appearance to the mouth. Teeth should replaced for several reasons though – not only for esthetic purposes. 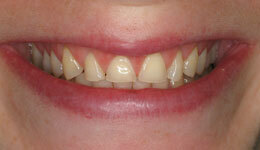 Missing teeth can cause a variety of negative effects both short and long term. Missing teeth can make it difficult to chew, limiting the foods you are able to enjoy and potentially causing related problems with digesting food that has not been properly chewed. When a tooth or teeth are missing, the adjacent teeth can also sometimes move into the empty spaces, which creates additional space between teeth and can affects the bite. Missing teeth can also cause difficulty speaking, and can cause self consciousness and fear of smiling, which can destroy self-esteem. 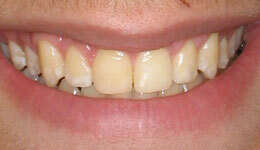 Traditionally, missing teeth have been replaced with prosthetics (likes dentures) or crowns and bridges. While these replacement methods can restore function and be effective aesthetically, they are not always the best option. Similarly, partial or full dentures can be very uncomfortable and can affect daily life as they can cause difficulties with chewing and speaking. This is especially true of ill-fitting dentures. Dentures have to be continually readjusted to adapt to the gradual loss of the jaw bone, which commonly occurs when the natural teeth are missing from the jaw. Bridges can also be detrimental, because the process of placing a bridge often involves grinding down of the adjacent teeth. 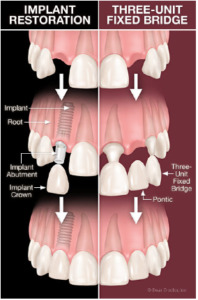 Dental implants have changed the way we replace teeth. Dental implantology has been in practice for several decades and is now an extremely well-developed procedure. Dental implants have an extremely high success rate for replacing anywhere from a single tooth to all your teeth! But that’s not the only reason to choose them. Check out the top 10 reasons you should request dental implants at your next appointment! Longer lasting (by up to 20 years) than crown and bridgework. Look, feel, and function with the strength of normal, healthy teeth. Will not break or decay. 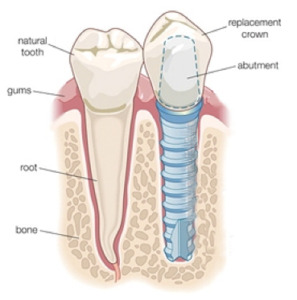 Replace the natural tooth root in the body, preventing bone loss and preserving gum tissue. Versatile, so they can be used to replace any number and combination of teeth. Can completely replace the need to wear a denture. Don’t cause complications eating, smiling, or talking and therefore improve quality of life. We use our precise color matching system in the planning and manufacturing of the crowns that will be placed on your implants. Each crown is custom fabricated to your anatomy, so your new teeth will be virtually indistinguishable from others. 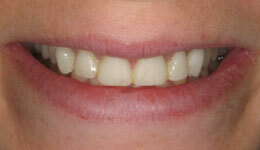 Best of all, dental implants greatly improve your appearance – you’ll have your old smile back. Don’t wait for your bones to deteriorate to start planning your teeth replacement procedure. Call our Midtown dentist office at (212) 581-1091 or book online today so we can get you into the dentist chair and out with your brand new smile!